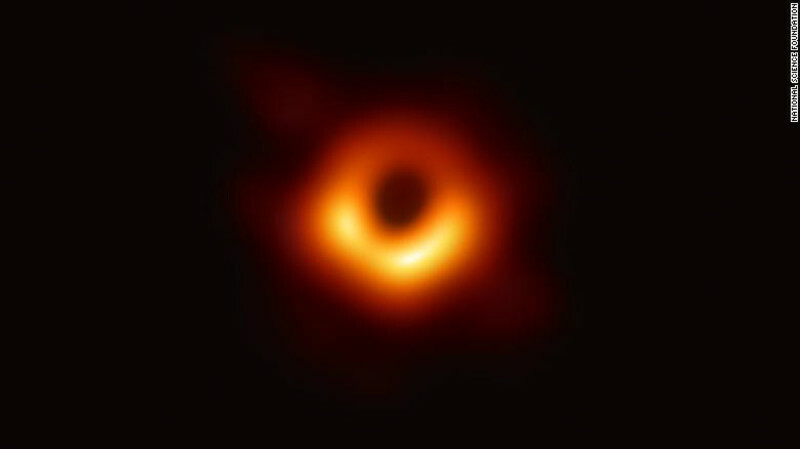 Big news was made in the scientific world by the first-ever photo of a black hole. But the black hole wasn’t what you saw…precisely because it’s a black hole. Black holes are stars (actually this one and many others are conglomerations of stars) which have imploded, becoming unimaginably dense. The black hole in the photo has the same amount of mass as 6,500,000,000 stars the size of our sun. All these swallowed stars, planets, cosmic dust and gas, etc., have been crushed down to what astronomers call a “singularity” with a gravitational force so titanic that not even light, moving at 186,000 miles per second, is fast enough to escape it. You can escape Earth’s gravity by going a paltry 7 miles per second. The complete lack of light coming from a black hole is what makes it utterly, absolutely black. And in the blackness of space, that makes it effectively invisible. What you see in the picture is material orbiting the singularity just far away enough and moving just fast enough, and an angle oblique enough to barely avoid being sucked into the black hole. The speed of the material causes it to take on that weird orange glow. So, you’re not seeing the black hole so much as you’re seeing an effect of it, known as an accretion disk. We know the black hole is there because of the effect it has. We will never see a black hole, itself. But, there can be no doubt they exist, based on their effects. We live in skeptical times, and that part about his resurrection was hard to accept in a simpler era. I mean, after all, there’s no photographic evidence. In fact, NONE of the Gospels actually depicts Jesus getting up and walking out of the tomb. The Gospel of Matthew, describes an angel rolling away the stone at the entrance, but it seems to have been rolled aside so the witnesses could get in, and not so Jesus could get out. He’s already gone. Matthew does set up the basis of the claim that Jesus’ body had simply been stolen. Many skeptics maintain that this is what actually happened and the whole resurrection story is a massive con. There’s no photographic evidence with a Risen Christ glowing like the halo around a black hole, or the disciples skulking away with his shattered corpse as the first step in an elaborate hoax. The claim the Jesus was raised in a physical manner was considered deeply subversive by the Empire and the Jewish religious and political establishments. Their response to the proclamation, “He is risen!” was brutal, repressive, and sometimes lethal. The disciples who made this claim painted targets on the backs, and they would never draw another safe breath. Still…even at the cost of their lives…they insisted that Jesus was not merely a sainted memory who “lived in their hearts” but the Chosen One whom God had raised from death. No matter how ludicrous, treasonous, or blasphemous that sounded, and no matter the price they paid for saying it. What really proved convincing was the transformation they underwent. They became people of extravagant love and extraordinary generosity. They backed their wild words with a wild grace. The kind that only comes from people who have been profoundly changed by something truly extraordinary. Everybody likes “nice.” It causes no controversy. It does not upset the privileged or the powerful. It doesn’t challenge the status quo in any fundamental way. Nice is satisfied with dispensing band aids and bland smiles. The wild and dangerous proclamation of the Gospel is not that Jesus was a really nice guy. Clearly, He made some people very unhappy, and they didn’t find him that nice or polite. The proclamation is that this man who so offended the rich, powerful, and pious that they utterly crushed him, was raised from death by the Creator of the Universe as the ultimate validation of what He had to say. We have looked into that universe and seen an example of the most powerful physical force in it…a force more powerful than even light…the fastest thing in it. But, we also proclaim Someone who has not been swallowed by the darkness. Who, despite our best and most violent efforts to smother it, is the personification of the Light we need. People need to see that Light now. We know there is a black hole in that picture because of the halo of light surrounding it, which gives evidence of its effect. People will only know of God’s presence, if we give evidence of it through our willingness to love. Our willingness to love is pinned to our willingness to see Jesus as more than just a “nice guy,” but the wild, boundary breaking love of God, which not even death can stop.